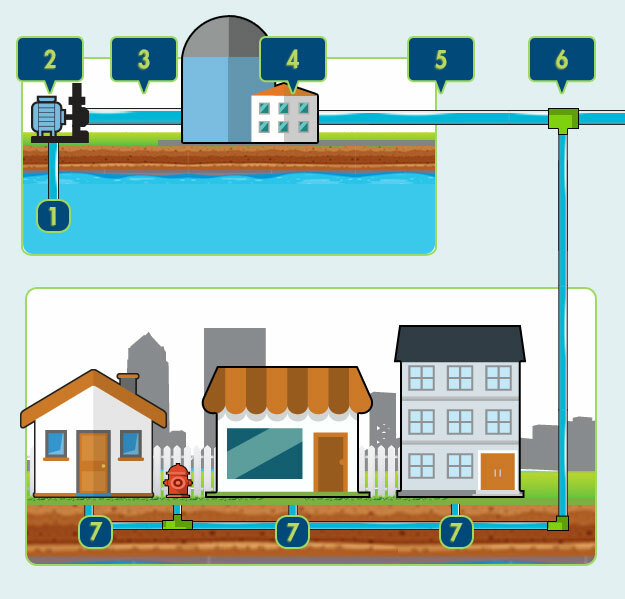 The JEA drinking water system consists of wells, water treatment plants, the distribution grid of pipelines, and finally the customers' meters. We have over 130 wells that withdraw water from the Floridan aquifer, about 1,000 feet below land surface. The fresh, clean water is pumped from the well fields to one of 38 water treatment plants, where it then flows through an aerator to remove the sulfur (rotten egg) odor. The water leaves the reservoirs and is disinfected with chlorine per health regulations before it enters over 4,600 miles of water lines for distribution to our customers. 1. The Floridan Aquifer is an underground river that courses through limestone formations many hundreds of feet underground. 2. Deep Well Turbine Pumps are used to draw the water from the aquifer and deliver it through 3. Well Headers. At the 4. Water Treatment Plant, the water is aerated, stored, and eventually chlorinated as needed. 5. Transmission Mains carry the potable water throughout the many miles of service area and ultimately deliver the water through 6. Distribution Mains, service connections, and water meters to our 7. Customers. JEA’s Major Grid provides water to most of Duval County and the northwest portion of St. Johns County. JEA also supplies water to the Yulee area, Mayport, and from Ponte Vedra south to Vilano Beach along A1A. Also along the Intracoastal Waterway in Palm Valley there are two small areas that get their water through interconnections with the St. Johns County Utility Department. Our grid arrangements provide reliable water service backup as needed, particularly during emergencies or periods of routine plant maintenance shutdowns. Since your water comes from the pristine Floridan aquifer, most of the elements found in it occur naturally. However, we do add a little chlorine to the water to keep it clean as it travels through pipes on the way to your faucet.